The weather was scorching, but that didn't stop our tour guide (Paul) from showing us the sights. Lovely holiday - we'll be back! Liz and Paul have a villa - with pool! - in the tiny village of Castelnau-d'Aude, mid-way between Carcassonne and Narbonne. Lovely place to stay with excellent hosts! The area in and around Castelnau-d'Aude is lovely. The river Aude and the Canal du Midi both run within a mile or so to the north of the village, and the Lac de Jouarres near Homps is a good alternative to the longer trip to the Med. A short drive north of Castelnau is the medieval village of Minerve. In the 13th century, during the crusades against the Cathars, this was the site of a famous siege and subsequent massacre. Sobering history, but a fascinating place to visit. One of the closest points to Castelnau on the Mediterranean Sea is Guissan, just beyond Narbonne. Liz's friends Michelle and Mark have a penthouse apartment there - very nice. A trip to see (Liz and) Paul in France isn't complete without visiting an Abbaye! 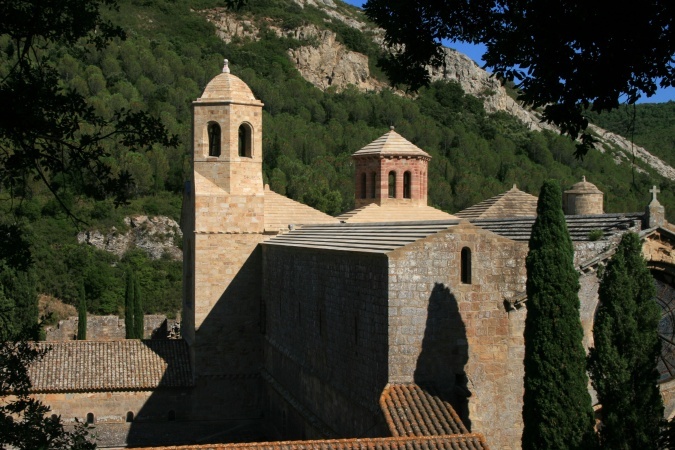 The Abbaye de Fonfroide was a great choice - very serene and welcome relief from the searing heat. The walk to the cross on the hill overlooking the abbey was tough, but at least there was a cache at the top!